There used to be two Melbourne observation decks, now there is only one! Towering over the Melbourne skyline on the south side of the Yarra is the Eureka Skydeck. It gives you 360 degree views of Melbourne. It is one of the great Melbourne tourist attractions. You can visit Eureka skydeck at a much reduced rate with the Melbourne Sightseeing and Attraction Pass. This is available for short stay tourists, and also for locals who can visit five Melbourne attractions at much reduced rates over a 3 month period. The Eureka Skydeck is a modern flashy spectacle that has managed to outlive the more conservative Rialto tower in the centre of Melbournes business district. The Eureka observation deck is the highest viewing platform in the Southern Hemisphere. It is located high up on Melbournes highest and newest sky scraper at Southbank. The views from up there are absolutely stunning and worth the experience. The Eureka Skydeck tries to impress with speed and effects. It has a very fast lift that speeds you up onto the 88th floor. It is going for a total Melbourne experience by playing an array of Melbourne sound effects, such as cheering football crowds and horse racing commentaries. This can be distracting and some find it to be taking away from the viewing atmosphere. Eurekas great attraction is the Edge, a 3m all-glass cube that slides out from the tower, leaving you suspended almost 300m off the ground. A freaky experience to be suspended and seeing Southbank 300m below you! It is a novel concept and in no need of the noise sound effects that add to it. It is not included in the entry and can make the Eureka experience expensive. The Eureka Skydeck has a large glassed in inside viewing area, an outside terrace and a canteen with take-away food - but no opportunity to sit somewhere comfortable and just hang out. 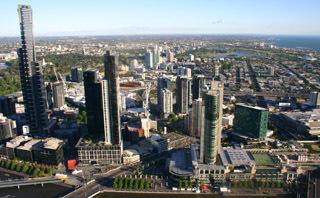 The Eureka Melbourne observation deck is located behind the Southbank promenade, halfway between Princess Bridge and the Crown Casino  right between the two foot bridges. It is only a short walk from Federation Square and sightseeing along the Yarra.